Yahoo Inc's new 37 years old CEO Marissa Mayer sketched out her plan for revamping the mobile and search advertising business on Monday, outlining publicly for the first time her vision for getting the ailing Web company back on its feet. But the thought on everyone's mind at the event was "how cute is she?" let me know. 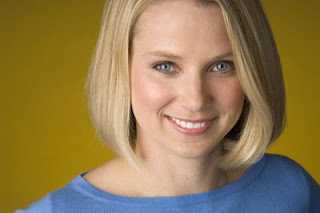 Mayer, once a rising star at Google Inc who took charge at Yahoo in July, told analysts on a conference call she wanted to focus Yahoo's efforts around the "daily habits" of users such as email, the home page, Internet search and mobile devices. But her top priority is to fashion a coherent strategy to manage the industry's transition to mobile devices, a fundamental shift that some of the most innovative Silicon Valley companies - from Facebook Inc to Google Inc - are struggling with. "The mobile wave is a huge wave for us to ride," Mayer said on the conference call. The 37-year-old CEO talked about working more closely with software provider and Web search partner Microsoft Corp, while employing technology to shore up its display ads business through such features as automated buying. She added that the company is likely to begin withdrawing from international businesses that fail to grow. This month, executives said the company will pull out of South Korea, a market full of local rivals. And she said that the company would primarily focus on "smaller-scale" acquisitions to bolster Yahoo's products, assuaging some shareholder concerns that the company could embark on an expensive shopping spree. 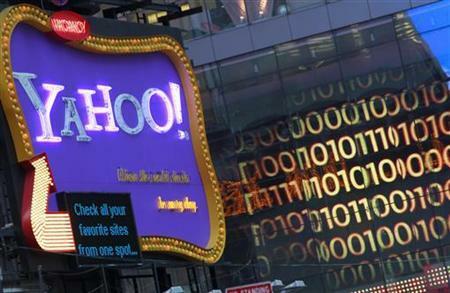 Yahoo shares were up more than 4 percent at $16.50 in after hours trading on Monday. "She handled the call very well," said Gabelli & Co analyst Brett Harriss. "You have the tone of a professional CEO who just wants to block and tackle better and move the company forward," he said, noting that he detected echoes of Google's business approach in Mayer's comments. Mayer is expected to focus on revamping Yahoo's technology and products, shifting course from the media-centric approach embraced by her immediate predecessor, Ross Levinsohn. The company's quarterly earnings beat expectations, but Wall Street had been keen to hear Mayer outline her plan for reviving the struggling Web company's revenue growth. "The fact that the quarterly results didn't show any massive deterioration was a decent sign and gives her probably more time," said Macquarie Research analyst Ben Schachter. He said the vision outlined by Mayer did not sound radically different from what previous Yahoo executives have espoused, but the company has continually struggled to implement that strategy. "It's about can Marissa and team execute and that's what it's been about for the past few management teams," Schachter said.